Caption slip reads: "Photographer: emery. Date: 1953-09-13. Reporter: Emery to RW. 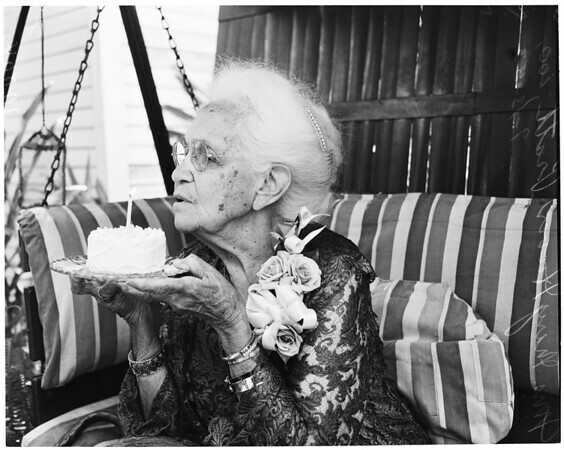 Assignment: 100-yr.-old birthday. 22-23-49-48: Blowing out that 100th candle: Mrs. Mary Hoover Pratt, 100 years old, celebrating birthday at home, 1025 Gaviota Ave., Long Beach. 44: Kindly 100-yr.-old (left) and her great granddaughter Miss Barbara Hall, 21, of 809 Glenmont Ave., LA, exchange toast: grandma's 100th birthday, Barbara's wedding coming up 8 pm Friday, 18th at Wilshire Methodist Ch., LA."